The goal of restorative dentistry and endodontics is to retain the natural teeth with maximal function and pleasing esthetics. It is generally agreed that the successful treatment of a badly broken tooth with pulpal disease depends not only on endodontic therapy but also on good prosthetic reconstruction of the tooth following endodontic therapy. Various methods are available for the same, but a good intraoral examination is of utmost importance on deciding the treatment plan and choosing between direct and indirect restoration. 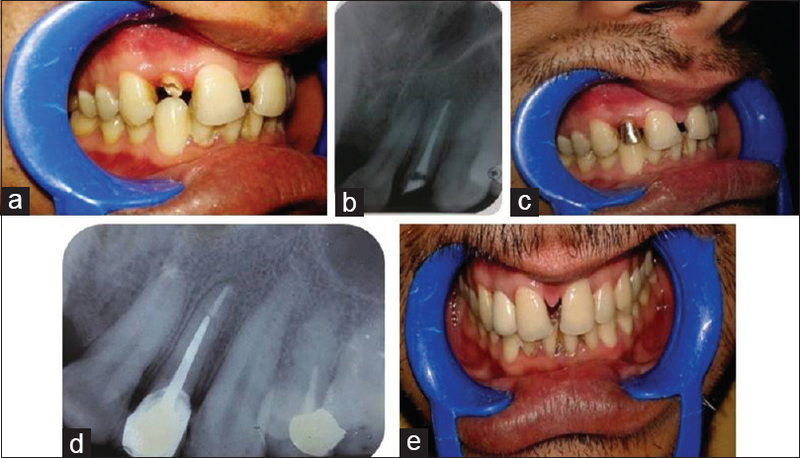 The aim of this article is to discuss cases of grossly mutilated endodontically treated teeth (ETT) which need esthetic and functional rehabilitation by the use of indirect intraradicular devices. ETT with excessive loss of coronal tooth structure of more than 75% and fractured teeth which require a change in angulation of the teeth can be restored with a customized post and core to enhance the strength and durability of the tooth and to achieve retention and esthetics of the restoration. The goal of restorative dentistry and endodontics is to retain the natural teeth with maximal function and pleasing esthetics. Comprehensive treatment plan is required before the start of endodontic treatment. When the decision is made to treat the teeth endodontically, consideration must be given to the placement of the subsequent restoration. It is generally agreed that the successful treatment of a badly broken tooth with pulpal disease depends not only on endodontic therapy but also on good prosthetic reconstruction of the tooth following endodontic therapy. There are two main categories of post: custom-fabricated (indirect) and prefabricated (direct). The first system involves with the cast dowel and core that closely reproduces the morphology of the root canal space. In the second system, adhesive materials and techniques are used for the intraradicular cementation of prefabricated systems. A 28-year-old female patient presented to the Department of Conservative Dentistry and Endodontics with a chief complaint of fractured maxillary central incisors caused by an accidental fall 1 month back. Thorough intraoral examination revealed Ellis Class III fracture with respect to both the central incisors. It was also observed that the teeth that were fractured were originally proclined and there was crowding with respect to lower anteriors. Root canal treatment of 11 and 21 was considered as the pulp was involved. Since an esthetic rehabilitation was important in this case, the treatment planning included the fabrication of post and core followed by porcelain-fused-to-metal crown. As the teeth were proclined, to change the angulation of the central incisors for better esthetics, cast metallic post and core (indirect) was planned. Teeth were prepared with a circumferential shoulder preparation including a 1.5–2-mm ferrule preparation. More tooth structure was reduced in the labial front than the palatal to correct the angulation of the teeth. Wax pattern for the post and core was made with inlay wax in the corrected angulation and was invested immediately after which the casting was carried out. Custom-made post and core unit was cemented with glass ionomer luting cement in the canal space of the maxillary anterior teeth 11 and 21 followed by the cementation of porcelain-fused-to-metal crown. The treatment outcome fulfilled the patient's expectations concerning the esthetic appearance of the anterior teeth [Figure 1]. A 32-year-old male patient presented to the Department of Conservative Dentistry and Endodontics with a chief complaint of a fractured tooth in the upper front region and was concerned about the esthetics. The patient gave a history of accidental trauma 2 months back followed by root canal treatment of the maxillary right lateral incisor 1 month ago. The patient was asymptomatic. On clinical examination, fractured maxillary right lateral incisor with less than two-thirds of the tooth structure remaining was observed. Radiographic examination revealed root canal treated 12 with good apical seal. Since there was a loss of excessive coronal tooth structure of more than 75%, customized post and core followed by porcelain-fused-to-metal crown was planned. In the same way as discussed in the above case, cast metal post and core was luted followed by cementation of porcelain-fused-to-metal crown [Figure 2]. The prognosis of ETT depends not only on the treatment but also on the placement of coronal restorations. One of the treatment options for endodontically treated fractured anterior tooth is to restore it with a custom-made cast post and core or prefabricated posts followed by full-coverage crowns. The customized cast post and core possess superior adaptation to the root canal, associated with little or no stress with installation, and high strength in comparison to the prefabricated post. One advantage of cast post and core is that the core is an integral part of the post and that the core does not depend on any mechanical means of retention on the post. Prefabricated posts are popular because of their ease of placement, less chair-side time, lower cost, and the ability to restore a tooth for immediate crown preparation; they also rely principally on cement for retention. In the first clinical case, custom-made metallic post and core was planned as the fractured teeth were proclined and hence angulation and the design of the core of the cast post could be modified to produce a more convenient shape for the crown of the proclined teeth. This fulfilled patient's esthetic demand as well as functional rehabilitation. In the second clinical case, custom-made metallic post and core was planned as there was a severe loss of coronal tooth structure, and this construction prevents the dislodgement of the core from the post and root when minimal tooth structure remains. In the above-described cases, it can be concluded and highlighted that the two main indications of customized cast post and core for ETT with excessive loss of tooth structure are in cases where the angulation of the teeth needs to be altered and second when there is a loss of >75% of coronal tooth structure, to enhance the strength and durability of the tooth and to achieve retention and esthetics of the restoration. The treatment described in the above case reports is simple and effective and helps accomplish the patients' esthetic and functional requirement. Rosenstiel SF, Land MF, Fujimoto J. Contemporary Fixed Prosthodontics. 2nd ed. St. Louis: Mosby, 1997; p. 238. Peroz I, Blankenstein F, Lange KP, Naumann M. Restoring endodontically treated teeth with posts and cores – A review. Quintessence Int 2005;36:737-46. Franklin S. Weine Endodontic Therapy. 6th ed. St. Louis: Mosby; 2004. p. 553-61. Silva GR, Santos-Filho PC, Simamoto-Júnior PC, Martins LR, Mota AS, Soares CJ, et al. Effect of post type and restorative techniques on the strain and fracture resistance of flared incisor roots. Braz Dent J 2011;22:230-7. Tang W, Wu Y, Smales RJ. Identifying and reducing risks for potential fractures in endodontically treated teeth. J Endod 2010;36:609-17. Saupe WA, Gluskin AH, Radke RA Jr. A comparative study of fracture resistance between morphologic dowel and cores and a resin-reinforced dowel system in the intraradicular restoration of structurally compromised roots. Quintessence Int 1996;27:483-91. Pontius O, Nathanson D, Giordano R, Schilder H, Hutter JW. Survival rate and fracture strength of incisors restored with different post and core systems and endodontically treated incisors without coronoradicular reinforcement. J Endod 2002;28:710-5. 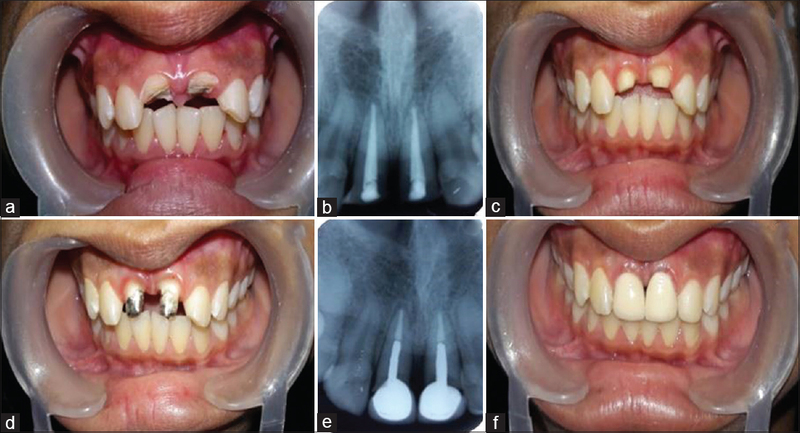 Chakravarthy Y, Chamarthy S. Richmond crown for restoration of badly mutilated posterior teeth: A case report. J Evid Based Med Health 2015;2:4500-7. Bartlett SO. Construction of detached core crowns for pulpless teeth in only two sittings. J Am Dent Assoc 1968;77:843-5. Assif D, Bitenski A, Pilo R, Oren E. Effect of post design on resistance to fracture of endodontically treated teeth with complete crowns. J Prosthet Dent 1993;69:36-40. Cohen S, Hargreaves KM. Cohen's Pathways of the Pulp. 10th ed. Mosby Elsevier, St. Louis, Mo, USA, 2010. p. 785. Goerig AC, Mueninghoff LA. Management of the endodontically treated tooth. Part II: Technique. J Prosthet Dent 1983;49:491-7. Bergman B, Lundquist P, Sjögren U, Sundquist G. Restorative and endodontic results after treatment with cast posts and cores. J Prosthet Dent 1989;61:10-5. Balkenhol M, Wöstmann B, Rein C, Ferger P. Survival time of cast post and cores: A 10-year retrospective study. J Dent 2007;35:50-8.